Award Winning School Gives SISIS Top Marks for Quality. The School has recently been presented with an Independent Schools Association award for Outstanding Provision in Sport, so it is essential that it maintains its facilities to the highest level and the decision to build a new sand based synthetic pitch certainly reflects this. 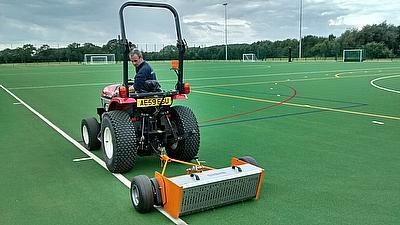 “We have so much sport played here at the school; it just made sense to build a synthetic pitch. The reason we went for a sand based surface is because it is predominantly going to have hockey played on it, although it is also marked out for football,” said Stephen. 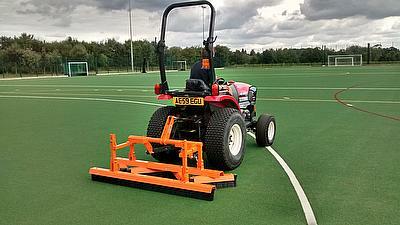 The SSS1000 is a tractor mounted rotary brush sweeper for use on synthetic turf surfaces. It removes surface debris, lifts pile and redistributes sand or rubber crumb infill. Equally important to the performance of a synthetic pitch is the Flexicombe which helps to maintain even distribution of the infill helping to ensure a true and level playing surface. “Maintenance is just as important to synthetic pitches as it is to natural turf – in fact it’s absolutely crucial especially when it is used as much as ours is. We’ve been told by the manufacturers that for each ten hours of play; it requires one hour’s maintenance on it. You can see that the surface starts to become shiny after a seven hour session on it and that’s when it starts to become slippery, which is dangerous for users. “We knew we needed top quality equipment to maintain the pitch and this prompted me to go and see a demonstration of the SSS1000. I was impressed with it straight away. It just has so many good points: It’s light, it’s easy to use on your own, and it has interlocking wheels at the side where you can put it into gear and out of gear. Because we have a new pitch we had small ends still left on the carpet where the lines had been cut and it has picked all of those up superbly. Any in-fill that was picked up and placed into the collector went through the holes and back onto the pitch surface; so you’re not losing any in-fill – all you’re taking off is the debris. “The same goes for the Flexicombe – it really is excellent. The reason we bought the Flexicombe was because we’ve got quite a few trees round the area which brings the possibility of algae or moss forming on the pitch surface. It keeps the surface clean and the pile standing up,” said Stephen. Also, with a small gate to enter the pitches, it is essential that any equipment he uses can fit through the gap. Stephen has constantly used SISIS products throughout his career and is quick to point out that it is the excellent customer service as well as quality equipment that keeps him choosing SISIS. “From the minute I ordered it to the minute it turned up the service has been excellent - as it has always been. If there was a problem with it I know that I could just call Jason Briggs, our area manager and he would sort it out straight away,” said Stephen.